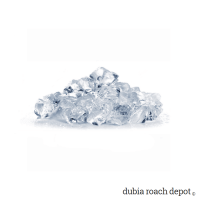 A safe, natural, rugged, renewable watering system for Dubia roaches, cleaner crews, and other captive insects that require supplemental water. 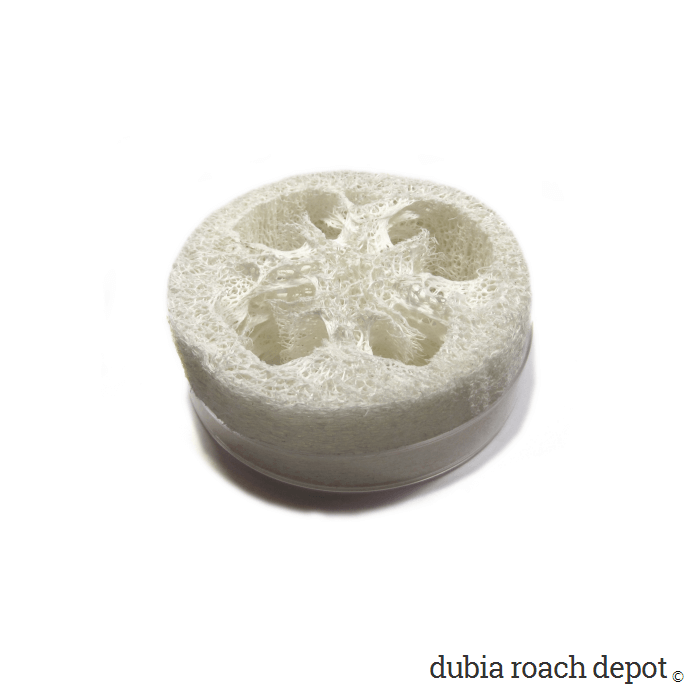 The Luffa Insect Watering Dish is a great way to provide water to Dubia roaches, cleaner crews, and other captive insects. It’s effective, safe, easy, inexpensive, and natural. It’s also simple, consisting of just two pieces: A clear polycarbonate dish and a fitted luffa sponge. Insects access water two ways with the Luffa Watering Dish. First, luffa contain thick plant fibers that draw and keep water. Insects can drink from the moist surface the same way they would from a sponge. Second, the rigid fibers form a scaffold system that insects can crawl in and around. They often use it to climb down to the water’s surface and drink directly. So how well does it work? It works great, actually. The Luffa Insect Watering Dish is an effective watering method that we use in many of our colonies. It’s very convenient. All that’s required is regular cleaning and occasional replacement. That’s good for us, but it’s good for the roaches too. 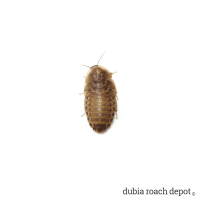 Dubia roaches are notoriously prone to drowning. While no watering method we’ve tried eliminates Dubia drowning entirely, this is among the best we’ve seen. We think it’s even better than water crystals. Generally speaking, luffa is a good material for use around water and insects because it stands up to use and repeated cleaning. If you’ve ever used luffa bath sponge or scrubber, you know how tough they are. They break down slowly even with constant use, and cleaning is easy. Just rinse with warm water when you refill the dish or every few days or week, and reuse. 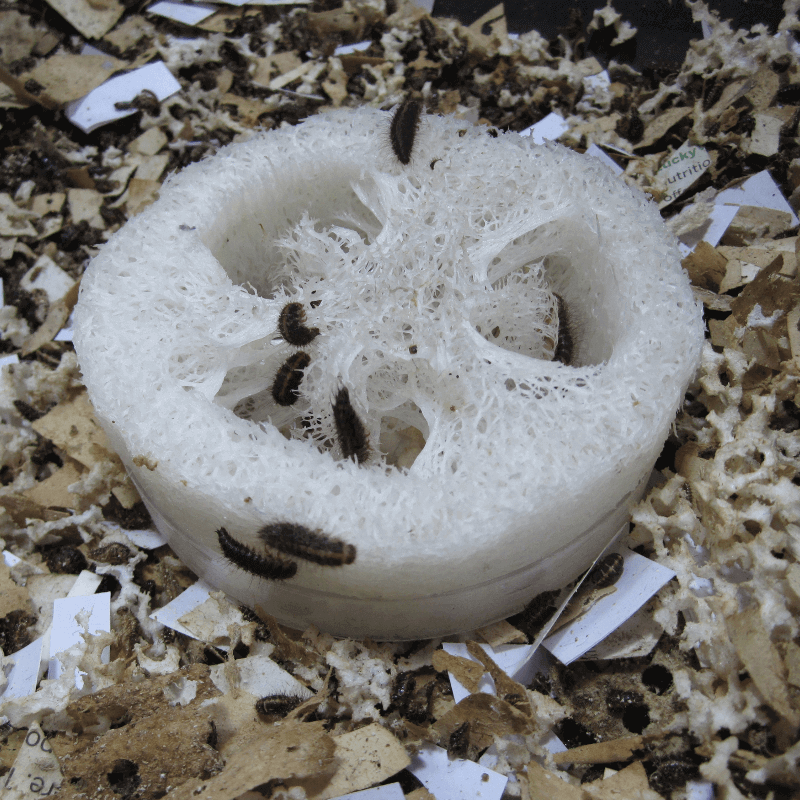 They do tend to get a bit dirty from all the roaches tracking frass on it, and they need occasional replacement, but luffa remain functional for a respectable length of time even in large colonies with lots of insects. Luffa is also 100% natural. It comes from a fast-growing vine that’s widely considered a sustainable resource. It’s more environmentally friendly than sea sponges, and certainly more than kitchen sponges made with petroleum and other chemicals. Luffa contain no chemicals as far as we know, and the Luffa Insect Watering Dish has led to zero health issues in our colonies. The only downside we’ve found is that sometimes the insects need a little coaxing to come out of hiding. This is only an issue at cleaning time, but it’s not a major issue. 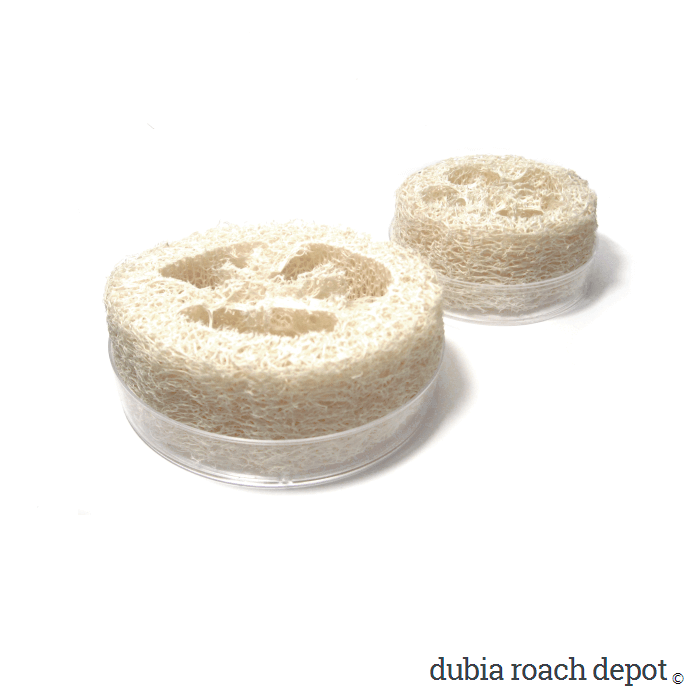 The Luffa Insect Watering Dish comes in two sizes: small and large. The small dish is 2-½ inches in diameter and best suited for colonies with up to about 500 or 1,000 roaches. The large dish is 3-¼ inches wide and the best choice for larger colonies. You can use either one in any size colony, of course, but the small dish will need refilling more often in larger colonies. 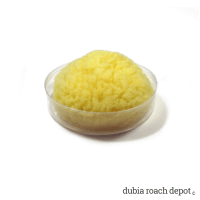 If you keep just a few Dubia roaches as feeders, small is probably adequate. Each piece of luffa is about an inch tall and comes paired with an proper size dish. We also have replacement luffa if you already have a dish. While the fit is often snug, it’s also OK to have a gap between the luffa and the dish. This is especially true if you house larger roaches. Luffa swell with water and shrink when they dry, and roaches can easily cross gaps about half their body length. Run the luffa under water and squeeze & release a handful of times. This improves its absorptive capacity and may make it easier to fit into the dish. Soak the luffa in warm water for a few minutes so it absorbs some water. Place the luffa in the dish. Press it all the way to the bottom. Fill the dish with water. Tip it sideways a bit to lower the water level to avoid spillage into the colony. Dry the bottom of the dish and place it in your colony. Check the water level every day or so. Clean and refill as needed. NOTE: You will need to scuff the outside of the dish with sandpaper or a scouring pad if you have nymphs, or if you want cleaner crews or other small insects to have access to the water. You can even scratch it with a sharp knife, but be careful with yourself and the dish, which may crack if you grasp it too hard.